Learn How You Can Benefit Today From the Essential Vitamin Biotin! Why Should I Choose This Biotin Supplement? Support for healthy hair, nails, and much more! Biotin is one of the most popular supplements for supporting hair, skin, and nail health. Biotin encourages a radiant appearance by nutritionally supporting the skin from the inside out. Biotin is also important for a healthy metabolism because of its role in converting fats and carbohydrates from food into energy. Weak nails are fragile, brittle, and can be easily split or cracked, which is often attributed to dryness and dehydration of the protein keratin. Biotin may help support your body maintain both nail strength and thickness through its function as a coenzyme support for protein synthesis. Waiting for your hair to grow can feel like an eternity. Unlike topical hair products, ingesting biotin helps you receive all of its benefits in a fast and effective way. Biotin supports glowing, radiant skin by helping your body fight against dry, cracking skin. By addressing these skin problems at a cellular level, you may see a difference in the appearance of skin on your hands and face. Biotin supports several metabolic functions of the body. It helps convert glucose from food into usable energy and helps the body use amino acids from proteins. All of this helps maintain a healthy metabolism. Biotin is sometimes referred to as vitamin H. The “H” stands for “haar und haut,” which is the German words for hair and skin. Be careful when consuming raw egg whites. These can prevent your body from absorbing biotin and, over time, could cause a biotin deficiency. Biotin may help your eyelashes grow longer. To get the benefits of biotin you need to take it every day. Your body can't build up reserves of biotin because it is water-soluble. This means any excess your body doesn't need at the time will be eliminated with your urine. Nearly 1 in 5 people, or about 20% of the population, report having brittle nails. This may be a sign of a biotin deficiency. A woman’s need for biotin increase during pregnancy because the embryo needs biotin to grow and develop. There are eight forms of biotin, but only one, d-biotin, is biologically active. Biotin combined with chromium has been shown to encourage normal blood sugar levels. Biotin was first discovered in 1927. It had to wait forty years before being officially recognized as a vitamin in 1967. Helps hair grow thicker, faster, and longer. Helps metabolize carbohydrates, proteins, and fats into energy. Supports brain health, memory, and normal cognitive function. Supports tissue and muscle growth. Supports normal cell and DNA formation. Needed for thyroid activity and adrenal function. Helps pregnant or nursing women. We are sure you will see and feel the health benefits of Biotin. Global Healing Center Biotin is extracted from certified organic Sesbania, a plant native to South Asia. Unlike traditional synthetic, isolated biotin supplements, true natural supplements, meaning those derived from plant sources, are processed in a way that captures the cofactors and co-nutrients necessary for the best absorption and utilization in the body. 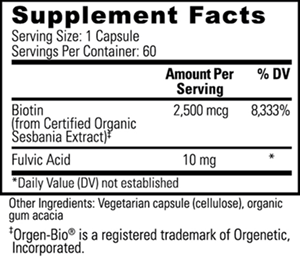 Global Healing Center Biotin is a full-spectrum, plant-based bioactive D-Biotin supplement. This Biotin supplement has been quality control tested to ensure a minimum chemical assay of NLT 0.5% biotin compounds. Unlike biotin added to topical skin and hair products that just washes away, ingesting biotin provides the most direct benefits. All-natural; no toxic additives, excipients, fillers, colors, or artificial ingredients. Contains no yeast or starch. 1. Am I biotin deficient? Signs you’re not getting enough biotin include thinning hair, brittle nails, or a red, scaly rash around your eyes, nose, and mouth. More extreme symptoms of a biotin deficiency may include depression, listlessness, hallucinations, and tingling in the arms and legs. People at the highest risk for a biotin deficiency include chronic smokers, alcoholics, pregnant women, and people with Crohn’s or liver disease. While these are general guidelines, exact amounts depend on different factors, including your diet. Much higher servings of Biotin are often considered by those looking to see results in their hair and nails, or when trying to overcome a prolonged Biotin deficiency. Global Healing Center chose a daily recommended serving to encourage optimal results that are safe and effective. As always, consult with your trusted healthcare practitioner to determine if Biotin or any other nutritional supplements are right for you. 3. Why is Certified Organic Sesbania Extract used? Sesbania Grandiflora is the best, vegan-friendly source of biotin. In fact, Global Healing Center's Biotin offers the cofactors and co-nutrients from the Sesbania plant that naturally promote the bioavailability of the biotin compounds. Some users report acne after using biotin. Starting with a lower serving and slowing increasing your amount of biotin may help your body better adjust to changes. Biotin is a water-soluble vitamin and your body does not store reserves, it needs to be taken every day. Give it some time to work. Biotin encourages healthy hair and nail growth by targeting cells deep within your body. Outward changes may not be immediate. Remember, as new hair and nail growth begins, you should start to see and feel a difference. Nutritionally Support Your Hair, Skin, and Nails with Biotin Today!! Will biotin cause unwanted hair growth? Can I take too much biotin? Is biotin safe to take with other Global Healing Center products? Can I take biotin with other medications? If I am pregnant or nursing, is biotin safe for me to take? Is biotin safe for children? What is the difference between biotin and d-biotin? How does biotin support metabolism? Many people begin taking a biotin supplement to increase hair growth on their head. Some people have reported an increase in body hair growth and thickness. This is because biotin helps your body increase overall hair health. However, don't worry about new hair growing in unwanted places. While biotin may increase existing hair thickness, it does not cause hair to sprout in places you have never grown hair before. As with all Global Healing Center products, it's best to use as directed. If your personal health needs call for different dosage requirements, then always consult with your trusted healthcare practitioner first. Global Healing Center offers many natural health supplements that encourage a wide array of healthy body functions. All of our products were created to work in a safe and synergistic way to promote good health. For specific concerns regarding your ability to safely add biotin to your daily routine, first consult with your physician, then contact our customer satisfaction team with any additional questions you may have. Even though taking biotin is generally safe, consult your healthcare practitioner before taking it with any other prescribed drugs or medications. Yes, biotin is a commonly recommended vitamin for women that are pregnant or nursing. For specific dosages and requirements please consult your physician. Generally, biotin should be safe to consume for children. Dosages should be based off specific age and and the advice of your healthcare practitioner. A small set of users have reported increased acne following biotin. While no direct link has been found, we suggest starting with a smaller dose, and if well tolerated, increasing to the full recommended daily dose. D-biotin is the naturally occurring, and only bioactive formation of the eight possible forms of the biotin vitamin. It is a coenzyme for numerous metabolic reactions in the body. D-biotin is involved in lipid and protein metabolism and helps convert food into glucose, which your body uses for energy. This compound is vital for maintaining skin, hair, and mucous membranes. Biotin is a B-complex vitamin required by every cell in the body. B vitamins are a class of chemically distinct vitamins that help your body process food into energy. Biotin helps the body metabolize fats, protein, and carbohydrates. The human body needs biotin for normal growth and development and it's especially critical for healthy embryonic growth. Sesbania Grandiflora, also known as Agati, is a fast-growing tree native to South Asia. Its flowers and leaves are traditionally used in food such as curries or the young pods are consumed raw. In several cultures, poultices are commonly created from the roots, bark, gum, leaves, flowers, and fruits. Sesbania is also known to be rich in thiamine, riboflavin, niacin, folate, vitamin c, calcium, iron, magnesium, phosphorus, and potassium.